Stephen Charrier, President of Rollerblade USA, and Rob Gill, of InlineSkates.com, review the 2015 Rollerblade Tempest 110C Inline Skates. We're talking about a really cool skate - the Tempest 110C moving to that really true high-performance skate in the Tempest lineup. What's kind of the first thing that jumps out at you with this skate? Well, the biggest feature, I think, is the lower cuff on this skate. All the Tempest skates come with a lower cuff on the skate which allows the skater to have a longer stride, basically. Still, it's an articulating cuff that flexes but it's lower than Macroblade skates or other skates below it. For sure. And then also coming with a carbon shell. Yeah, so the Tempest 110C is a full carbon shell in here which is a lighter material and it's really stiff so it's going to transmit energy really well. For sure. And talk a little bit about the fit of this skate. So, the fit on this skate, one you unique feature on all the Tempest skates is they have an asymmetric lacing system. So, the lacing is to the outside giving us more room to the inside, to the vamp of the skate on the inside. Skating is a lateral sport where we're pushing off to the sides like that, having more material to the inside gives us more power. Awesome. And then talking a little bit about the support on this skate you're getting micro-adjustable buckles. The buckle's really nice on the Tempest skates so they're both micro-adjustable so you can click it in to just that perfect spot and the instep buckle on the 110 also does the same thing, you can click it right in and get a really nice secure fit. For sure. And now moving down the skate, an extruded aluminum frame but probably one of the coolest features on the skate is the 110 Hydrogen Wheels. Yeah, so these wheels are really fast, Rob. They're 110mm Hydrogen Wheels. Hydrogen Wheels are our best wheel we can make basically, poured in the USA. They're very fast, high rebound, it makes a huge difference in the speed you get out of this skate. Definitely. And then an upgrade in the bearing here as well. This has our HTO bearing. It's the high temperature oil so it's an oil bearing - higher quality. It's gonna be faster. It also, the frame has a racing axle so it's basically threaded right into the frame. And this is an extruded frame here you can see too. And one thing about four 110mm wheels, is that the frame gets longer as you can see. Absolutely. Which cuts down a little on the maneuverability but a nice top end speed. Yeah, but for someone who is going to skate distances, it's a great skate for that. The frame is also laterally adjustable so you can adjust the frame in or out depending on your particular preference. Nice. And so now, who is the customer for the Tempest 110C? This is for someone who's an athlete, someone who wants to skate faster, skate distances, skate marathons, anyone who is training long distances. It's a fast, high-performance product. Awesome. So, thanks for joining us on the Daily Spin. 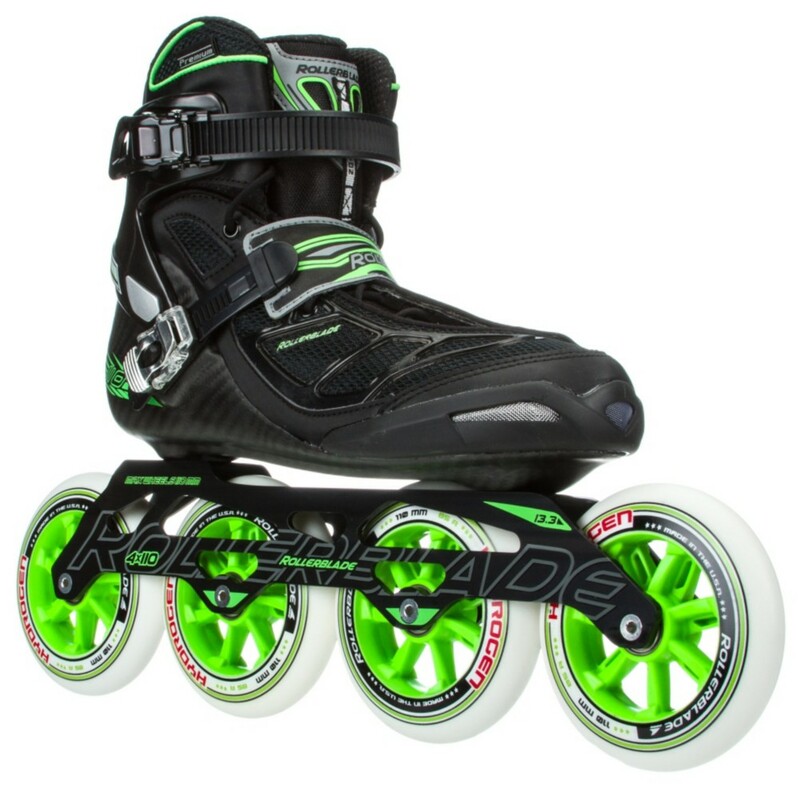 You can check out the Tempest 110C from Rollerblade on inlineskates.com.